“Hmm, I wonder why Bekki took the screen off the window”, I mused to myself. It was Monday afternoon and I had come home a bit early. I was in our bedroom putting my clothes away in the closet when I noticed the mosquito screen on our window propped up in the corner. I thought it was strange but figured Bekki had come up to the house earlier and was doing some sort of project. Nothing else seemed amiss. However, a quick look around and I realized a laptop was missing, then I noticed the hard drive was missing. My nightstand drawers were open, my money belt was on the bed, open, with my passport and credit cards strewn across the bed, and all the money gone. 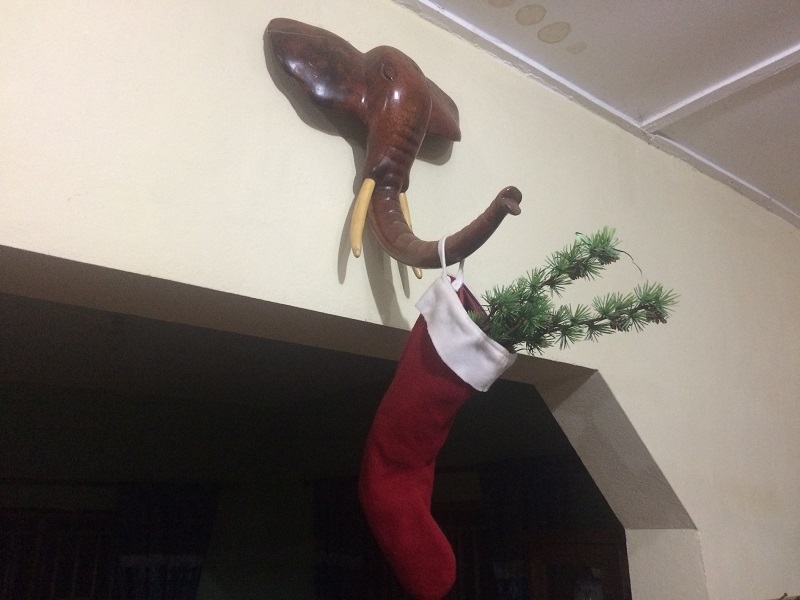 Finally, after nearly 4 years in Africa, we had been robbed. I guess that makes us official now. It took me a while to figure out how they got in as nothing was open. They had pulled out an iron bar in the window and squeezed through an incredibly small space. They got maybe $150 and the lap top I was going to donate to the hospital anyway and the hard drive with our entertainment on it, but not much else. Nothing we can’t live without anyway. So we count that as a victory. Oh yeah, that morning I had left $540 of donor money on the bed, but came home at noon to put it away, so they didn’t get that money. They came over the back wall sometime in the afternoon. Quick in and out job. But it still was unnerving. That night we slept (and still do) with a baseball bat at the edge of the bed. I figure I will whack them while they try to wriggle through the tiny gap in the iron bars. We hired a day guard, so the house is never left alone, and now we lock all the door in the house. So, if they break into one room they are going to have a heck of a time getting anywhere else. Even the bathrooms are locked. We kind of hope they break through a bathroom window, only to find themselves locked in a tiny room with just soap to steal. That started a week that was supposed to be better than the week before which had been majorly eventful and stressful. The capstone days were Thursday and Friday. As you know we (AHS) have the biggest, baddest autoclave in all of Sierra Leone. But it was not hooked up and there was no way I was going to tackle that job. So with the help of AHI and our grant from Winifred Stevens Foundation (WSF), we brought Rick King out here to hook up the beast and teach us how to use it. He had Wednesday, Thursday, and half of Friday to accomplish these tasks. My African colleagues are often quick to tell me, in an effort to calm me down, “Dr. Scott, this is Africa, relax, it will be OK.” That is all fine and good when there is no deadline, or plane to catch. 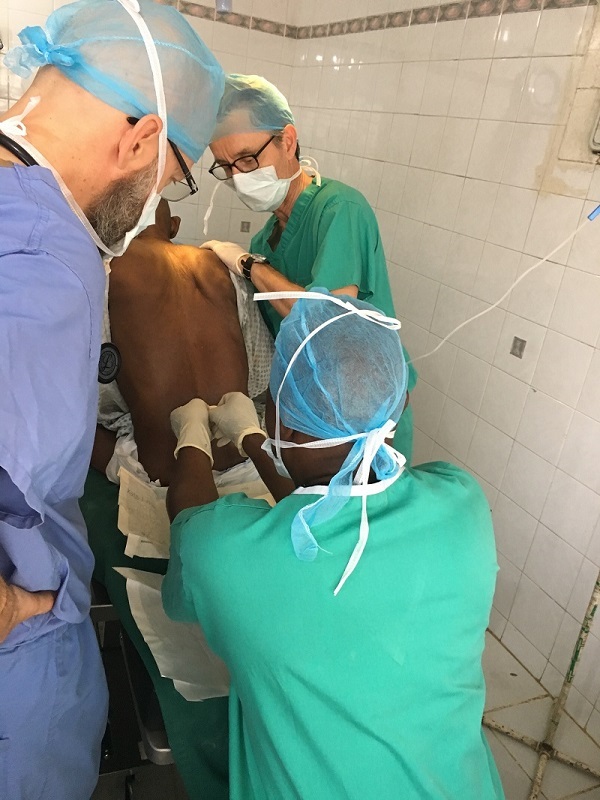 At the same time we had an anesthesia team from Western Carolina University, which was a huge blessing because on Tuesday I had to fire our anesthetist, and so had no other anesthesia but Professor Shawn Collins and student Joe Popa. Back to the autoclave and Rick. We really tried to have everything ready, but literally spent 2 1/4 days of the 2 ½ allotted days waiting for our maintenance guys to get all the piping we needed and fix the mistakes they made on the electrical. Even then it was jerry rigged, or is it jury rigged, I don’t know, and fuses were constantly blowing. Even the autoclave itself was spewing steam from places Rick had never seen, and the fuse in the boiler was bad. Then too, the hospital had not had water for 2 weeks because the main water line was broken again. Seems that plastic water lines that are buried less than an inch under a dirt road don’t stand up well to cars and three ton trucks driving over them. Even though the break is not on our property, the local government types said we had to pay to fix it if we wanted water, which would also then give them water, but they did not have the money, but we are rich, so AHS can fix it, for the third time this year. Steam autoclaves need water, and need a consistent source, so we rigged up a 55 gallon barrel in the sterilizer room and hooked that up, and fixed the water line, this time with metal fittings and concrete over it. But the main pipe is still plastic and is still under less than an inch of dirt and still being driven over. Wonder how long that will last? However, by the end of the day on Thursday the autoclave was hooked up and ready to go. Friday we would run it through a cycle and teach the staff. But Friday was also the anesthesia team’s last day and a lady came in with a nasty breast cancer, but still operable. I really wanted to do the surgery with good anesthesia, oh how I wanted to do it without having to fight off the patient during the case, or telling the anesthetist every move to make. So, I scheduled it for Friday morning. Friday dawns bright and clear with the promise of a great day. We went in early to get the boiler on the autoclave started. Lights came on and we anxiously watched the temperature and pressure gauges, not move. Finally, a blown fuse (Rick had never seen this before) on the boiler unit was found. We actually had something to replace it with, Praise God. Now the temperature started to rise, the pressure went up. I was in my office and wandered back to see how it was going. I can assure you it is a steam autoclave, our sterilizer room was now a sauna, the glass water level tube was cracked and steam was coming out like a nineteenth century locomotive. (We now refer to it as “Puff the Magic Dragon”.) Rick had never seen that happen either (in 17 years of doing this). He bypassed that so the steam would go to it’s intended destination, and we were in business. Then it stopped, ”Oh, you wanted a 60 amp switch for the autoclave, I got a 20 amp switch.” Yea that is what I wrote down when I told the maintenance crew what to get, 60 amp 380 V 3 phase. 20 amps just doesn’t do it. Rick has the patience of a saint. I, on the other hand, was assiduously avoiding the area because I had by this time flipped most of my internal breakers. All the troubles were solved, they bypassed the fuses on the switch (really safe) and we were off and autoclaving. About this time, I was called into the OR to start the mastectomy. I was happily prepping the patient when the power went off. Word quickly came to us that the generator was on fire. This was worthy of investigation. So, I scrubbed out and dashed up to the generator room. No flames, because JP knew how to use a fire extinguisher. Turns out that the radiator got blocked and so the engine overheated and caught the roof of the generator shed on fire. This is a Perkins (top British brand) 125 KW diesel generator, it is supposed to have safety shut offs for overheating, low oil etc. That is when I was shown the wire bypass someone had done to bypass those safety mechanisms. Wonder who thought that was a good idea?. Fortunately, about that time state power came on, so back to the OR, and back to restarting the autoclave. Sadly, state power is weak, so the air conditioning did not work and it was like operating at Bere Hospital. (Those guys are really tough.) During the most critical part of the operation the power went off again and I was so grateful to have my surgical headlight, axillary dissections are really difficult to do by braille. I think maybe that is why on Monday I really wasn’t that upset about the break in. Just didn’t seem that bad. It is all relative. Good news is the lady with the mastectomy is doing great, the autoclave now has 60 amp switches, and works, we actually sterilized some packs, we have had water all week, and the generator is back in service. God is good. For more frequent, up to the minute, short updates, please follow us on Instagram or on Facebook, we are Scott N Bekki Gardner. 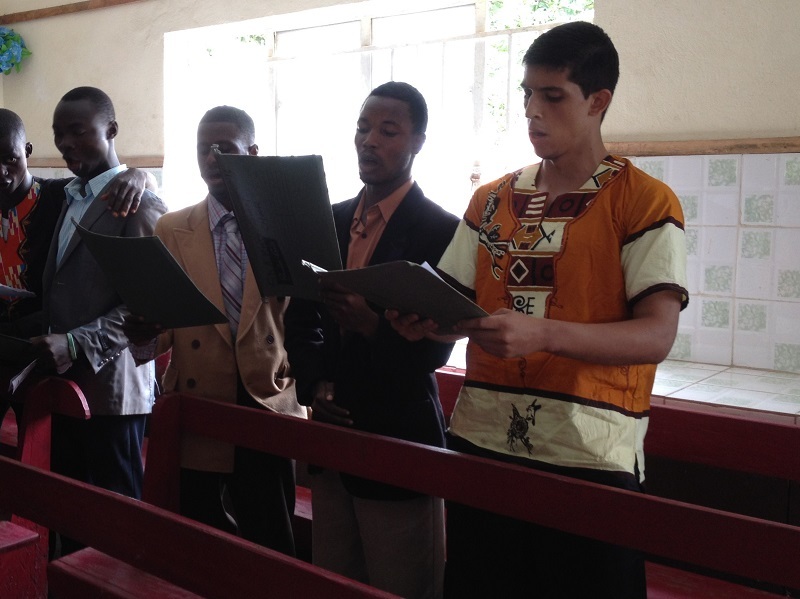 Three years ago, or so, wow it does not seem possible, I wrote a blog about worship in Tchad. Well it is time to write one now about worship in Sierra Leone. It is similar but also very, very different. First the similarities, morning worship starts the day. Day shift and night shift are all expected to attend. The only staff exempted are those working the afternoon/evening shift. We sing, pray, a staff member gives a talk, and often we have “contributions”, comments about whatever the topic was. We don’t do the handshake thing that was so big in Tchad, probably due to Ebola. That scared the Sierra Leoneans from any physical contact. And the singing here is much better. These guys can carry a tune, and harmonize. Then too, we have worship in the OPD (Out Patient Department) which has awesome acoustics. When the staff ramp it up on their favorite hymns it is positively heavenly. The Staff doing morning stretches. And worship time is very structured, Monday is administration day, so a staff member talks about their job, like say a cleaner (janitor), explaining what they do with their time, and often share some of their frustrations. There is usually then a long discussion where the most vocal staff voice their opinion on the topic, usually positive, but sometimes if it is perceived that the staff member is whining unnecessarily, they will be called on it. Tuesday and Thursday are health talk days, so a clinical staff member will give a treatise on hypertension or diabetes or nutrition, or any health related topic. 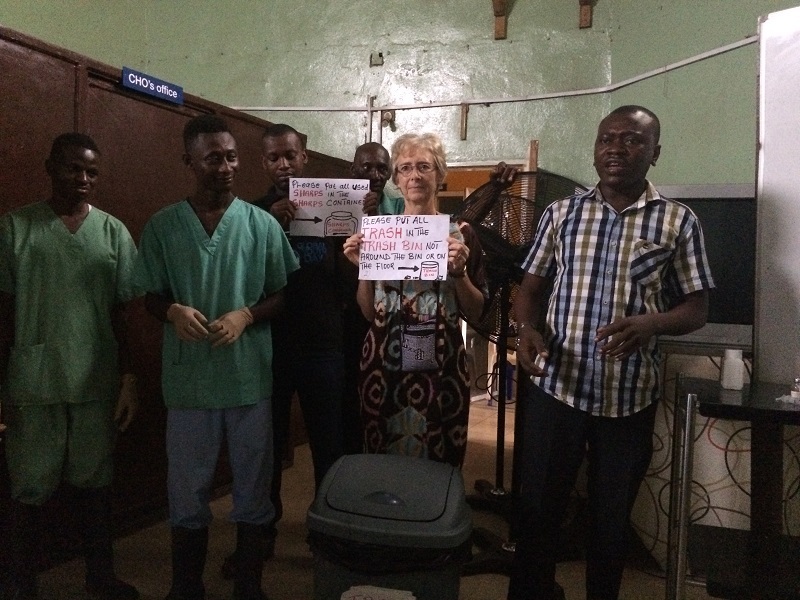 Lately the focus has been on waste management, and this morning our waste management officer (he is also our anesthetist, seems to me like a natural combination) talked again about proper waste disposal. You know like, putting sharps IN the sharps container, not on the lawn. And putting soiled bloody dressings in the proper dust bin (waste receptacle). Little thing like that. In fact, just last week the Waste Management Team did a skit for worship on that very topic, what waste goes where. This is a good thing to talk about in a country that seems to believe that any public place is a garbage repository, and that the entire country is one giant urinal. Our Waste Management Team doing their best to get the staff to put the medical waste not only in the trash, but in the right trash. Wednesday and Friday are reserved for more traditional worship talks, which are often very thought provoking, others, well, not so much. But by and large, morning worship is a great time of fellowship and comradeship. After worship we have the all important announcements, what committee is meeting that morning in my office, or what our upcoming schedule is. And after worship time is when we celebrate staff birthdays, births, and provide support to those who have lost loved ones. It is the time when we welcome new volunteers, or new staff with our “Welcome, Welcome” song, and it is the time when we say good-by to those who are leaving us. It is the time that the staff receive their certificates for attending and completing educational classes taught by our volunteers. 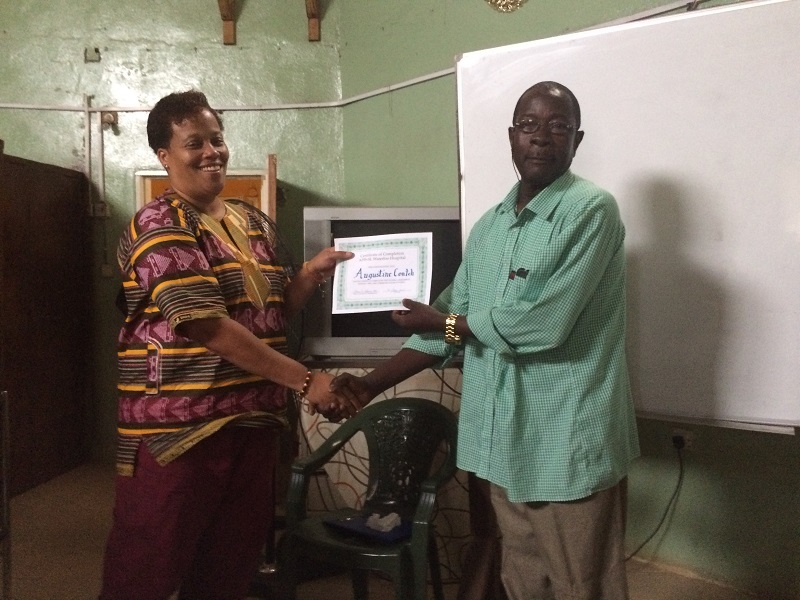 Nurse Karin giving Mr. Conteh his Certificate of Achievement. 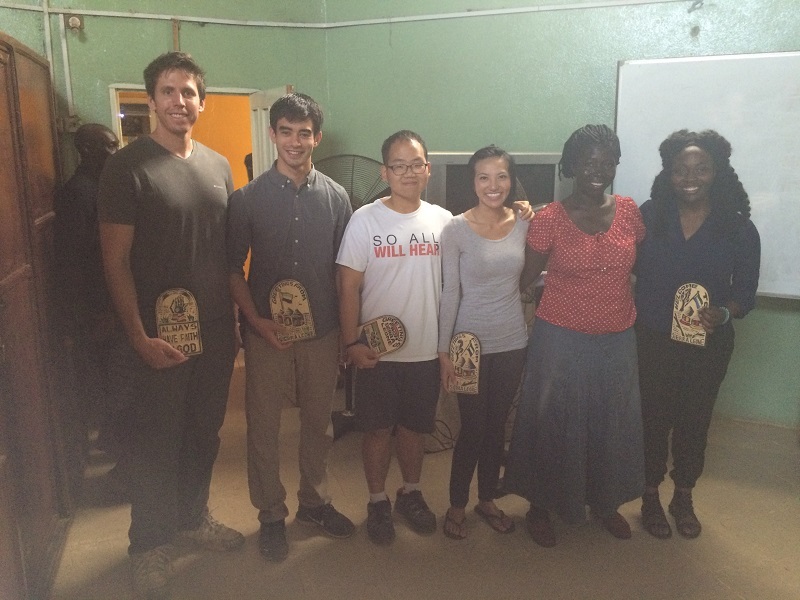 The Loma Linda University Pharmacy Team with their Sierra Leone plaques, signed by the staff. It is the time when we bless new additions to the hospital, from little things like dressing supplies and point of care hemoglobin monitors to larger items like physio beds, cars and even autoclaves. I have come to love this AHS tradition. It emphasizes the fact that everything we have here, everything we do here is for the glory of God, it is by His hand that we survive and function, and we owe it all to Him. So everything large or small is dedicated to be used to His honor and glory and in His service. Blessing our new Physio table from the UK. A particularly difficult farewell as the Peter Turay gives a heartfelt testimony about his brother Douglassss Turay at Douglasssss’s farewell. Morning worship is held, as I mentioned, in the OPD, so it is not uncommon to have patients and families attend worship with us. What is unusual is what happened last week. Two patients wanted to share their testimonies with the staff after the announcements. The first was Omo. She is a very brave woman who first came to us with a diabetic foot. It was really bad looking, but seemed to be viable and she was walking on it, so I did my best to save her foot. Sadly, the infection got out of control and started to spread up her leg. By the time we got her to surgery we had to do a high calf amputation and leave it open to let the infection drain out. It made me regret my earlier decision to not push for the amputation sooner. Anyway, when it came time to close the wound I had to explain to her that I could not save the knee. A below knee amputation would not leave enough length of bone below the knee to support a prosthesis, or be anything but in the way. Understandably, she was pretty upset. But she pulled it together and we got the job done, and her wound closed. 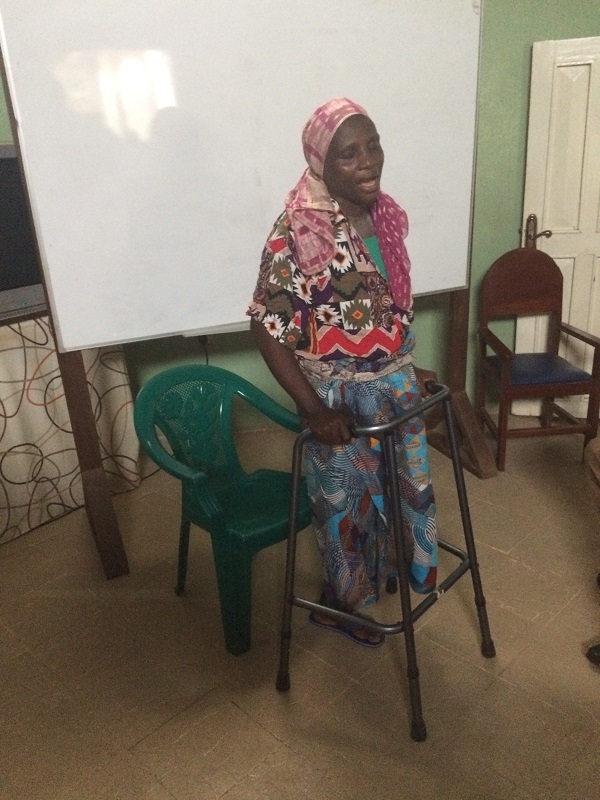 That morning she stood there on one leg, supporting herself with the walker and led the staff in singing “To God Be the Glory.” She then proceeded to praise God for His mercy, love and grace. I was so moved. Here was this woman who had just lost her leg, praising God in spite of it all. 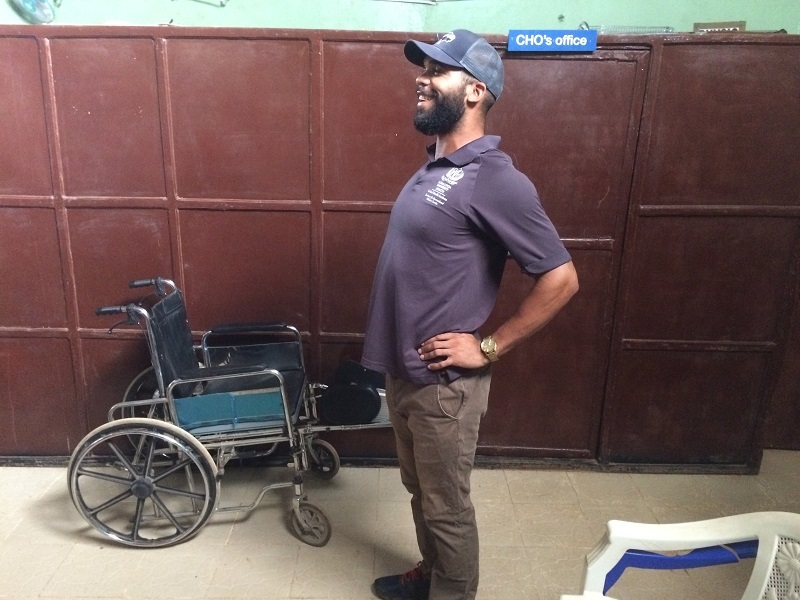 We are pretty good at praising God when He heals us, saves us or delivers us, but after losing a leg in a place that does not make it easy for the handicapped. Never saw that in America. Our Muslim brother leads us in singing, bring those hands together. Paul tells us in everything to be content and to give thanks for all things and in all circumstances. I would do well to learn from a woman with one leg and an old Muslim man. For more frequent, up to the minute short updates please follow us on Instagram or on Facebook, we are Scott N Bekki Gardner. In April of last year we held a two day strategic planning meeting. We came out of it with a bold, and to many minds, ridiculous, vision and plan. I of course was one of those who thought, “It can’t be done,” at least not anytime soon. Well, I thought I would just let you know what has happened to that Strategic Plan and how God apparently views it. And all that I am going to tell you is His doing, not ours. This is Part 3 of a Three Part Series. Chapel: Our mission is to demonstrate the healthcare ministry of Jesus. But Jesus did more than just heal people’s bodies, He healed their souls. In fact, that really is what it is all about. It is nice to help someone feel better for a time, but we all die eventually don’t we? So then what happens? If we have done nothing for their eternity, we have failed them. That is why we have put a strong emphasis on our spiritual ministries department, and that is why we have made construction of a chapel on the campus a high priority. The AHS church plant currently meets in one of the school rooms across from the hospital. It works OK, but it is too far for staff on duty to attend services, and too far for families and patients to join us. Furthermore, the outpatient department where we hold our morning worship is packed each morning with just the staff. It was clear we need our own chapel, as part of the hospital complex. The Chapel waiting for the roof, which will come after the Physio Building is done. A site was chosen and a 40X48 foot chapel floor has been poured. We also have a 20X20 foot room attached to the chapel that will service as patient and staff library and conference room. Very soon, by the grace of God, the walls will begin to rise and hopefully by the end of 2017 we will be in our new chapel. The AHS church members are working hard to furnish the new chapel. The first model pew has been constructed, and they currently have funds for another 15 pews. A new pulpit and desk have already been fabricated and are in use now. Much work remains, but soon there will be a house of prayer for all, that will be open any time during the day that people need a place for meditation and prayer. In November, 2016 the women’s auxiliary from Loma Linda donated the money for the 4WD vehicle. It came at just the right time too, because not 2 weeks after we licensed that vehicle the van was involved in an accident that has knocked it out of commission for 4 months now. (Hopefully it is coming home the first week of April.) Our Nissan XTerra has been a little workhorse for us, taking our mobile clinic team to places no vehicle should go. Blessing the new (to us) Nissan XTerra. But the ambulance, where to get an ambulance? About the same time our friends from French speaking Europe, specifically AMALF which is the Adventist French speaking medical association found a Mitsubishi that, thanks to Remy Herschey from Geneva, was able to be retrofitted as an ambulance. It landed here in Salone the last week of March, so there you have it. Less than a year from the strategic planning and we have all the vehicles under our roof, so to speak. 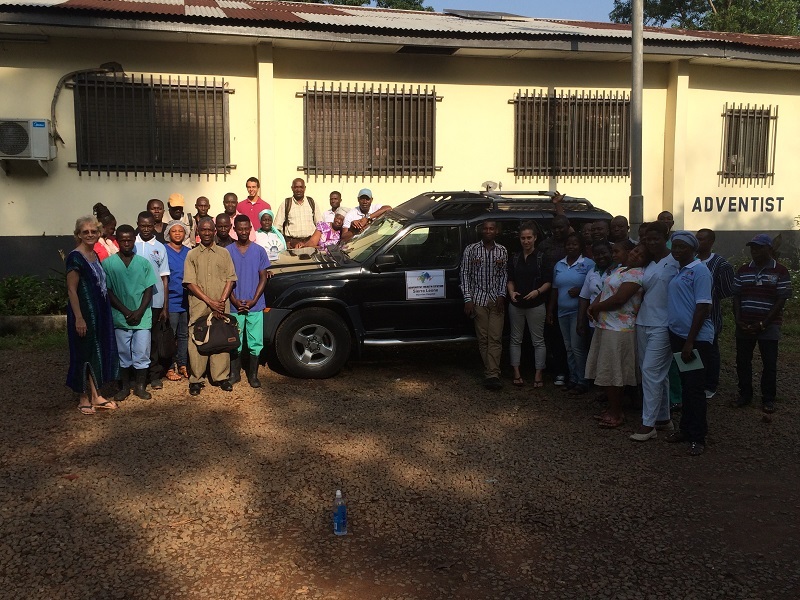 Mobile Clinic/Community Outreach: Before Ebola AHS had an active mobile clinic program. They had a large ambulance that could serve as a small clinic, and the staff would take it on outreach missions. 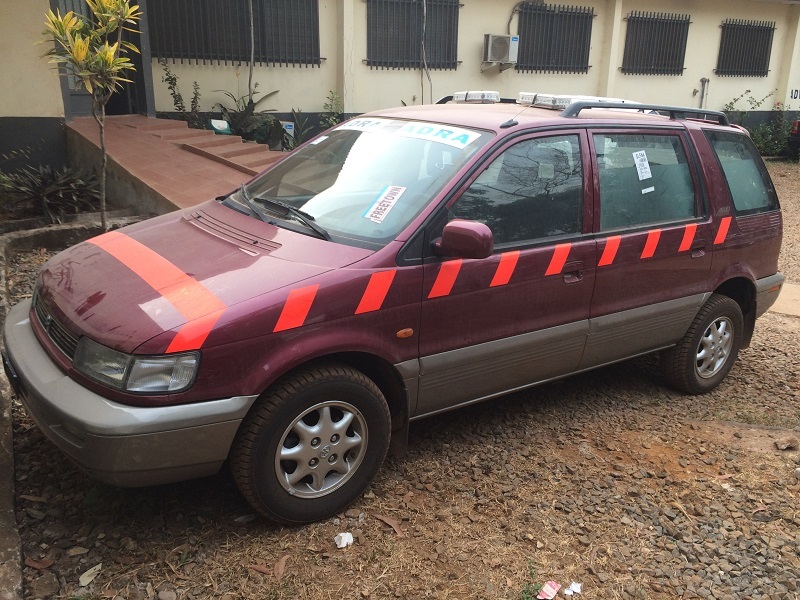 The ambulance had seen better days and was sold to a man who had plans for it, I guess. Really it was not in usable shape. 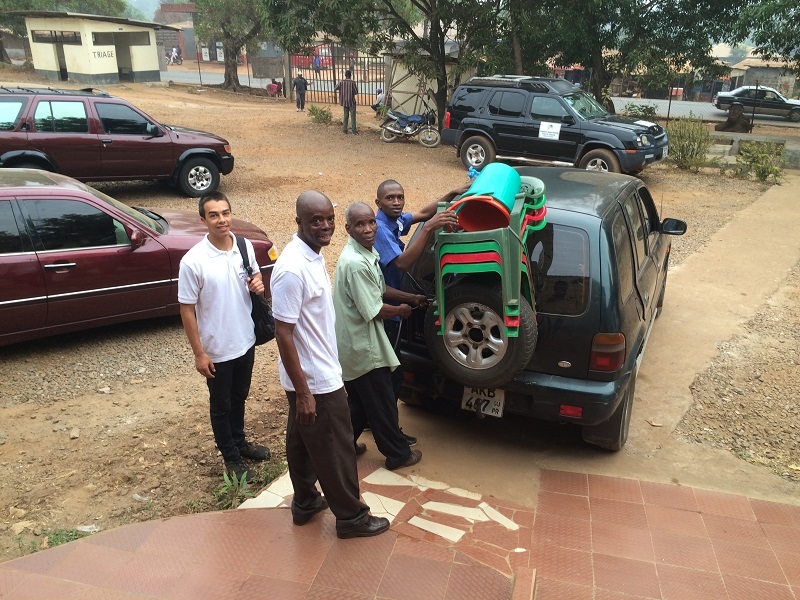 But…we wanted to revive our mobile clinic program. The elected head (Councilor) of a large area with many rural villages about 15 miles from here came to us, imploring us to come to his villages and do mobile clinics. If you could see the roads these people have to travel on you would understand how difficult it is to get to medical care unless it is in your village. So, Mr. Abu, our Community Health Officer (CHO) and Erin Acosta, our Public Health volunteer, got to work and set up a mobile clinic program. It is quite a production with everything organized into tubs and boxes, complete with collapsible tables and chairs so all will fit in a vehicle. A pharmacy formulary was carefully chosen and then modified as we had needs and all the meds prepackaged in unit doses for easy and rapid dispensing. The mobile clinic goes out every week to a different site and usually sees around 30-40 patients, although some days as many as 120 have been seen. It should be noted though, that this is not a “screening clinic” as many mobile clinics are that see 200-300 patients in a few hours. 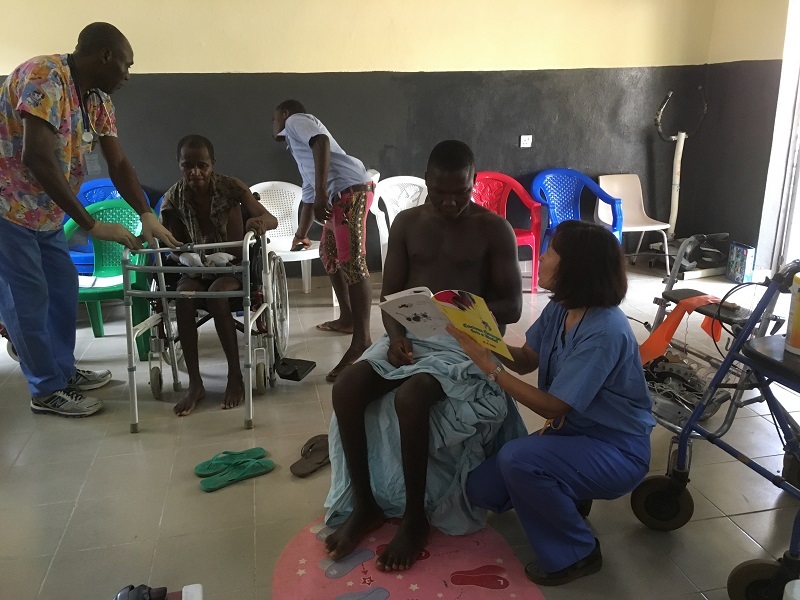 This is a full clinic where we obtain demographic data, full vitals, consultation and dispensing of medications, dressings and injections as needed. Mobile Clinic Team packed up and ready to go. Early on it was clear that the population most in need of care was the children, it also became clear that the people in these small villages are desperately poor and are often faced with the choice of food or medications, and even $2 or $3 is too much. Thanks to a grant from Restore a Child we were able to develop a charity mobile children’s clinic. For 3000 leones ($0.40) each children are evaluated and treated and given a 1 kilogram bag of rice. 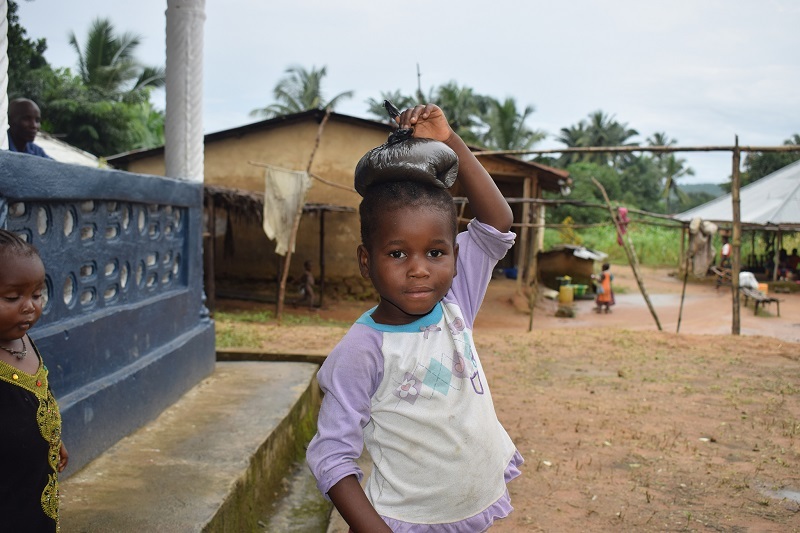 Restore a Child underwrites the expenses with a grant (gift) for which we and the people in rural Sierra Leone are grateful. 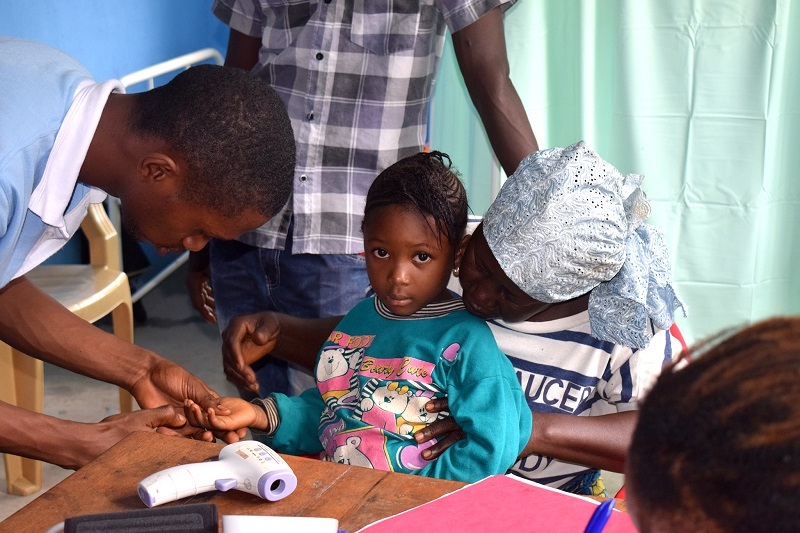 The program is wildly popular as now mothers and fathers can bring their sick children to the mobile clinic knowing that they will be able to get care. This year we expanded the mobile clinic to a more traditional screening clinic, for hypertension. Hypertension is a huge problem for Africa, and as the “silent killer” most people have no idea they have it. Once a week the mobile clinic team goes out (now in the ambulance) to one of the markets or some other well populated, busy place and sets up their free Blood Pressure Clinic. They will usually screen 140 to 180 people and find about 20 to 30 people with high BP, sometimes very high. The staff carry BP meds with them which is then dispensed for those willing to start treatment. Thanks to the generosity of some of our supporters we also have funds to assist those who need the medications but can’t afford them. The staff then do lifestyle teaching and encourage the folks to follow up, either at the hospital or at least at the next BP screening. A little guy with his bag of rice on his head. Remote Clinics: I have often repeated the story of my first day at Waterloo Hospital. Everywhere I saw ”AHS”, which I learned stood for “Adventist Health System”. I tried to find out where the other facilities were located, since “System” implies more than one hospital or clinic. I was told, with a smile, that there aren’t any, yet. But since 2000 when AHS was created, they have been praying, planning and hoping that someday they would be a system. 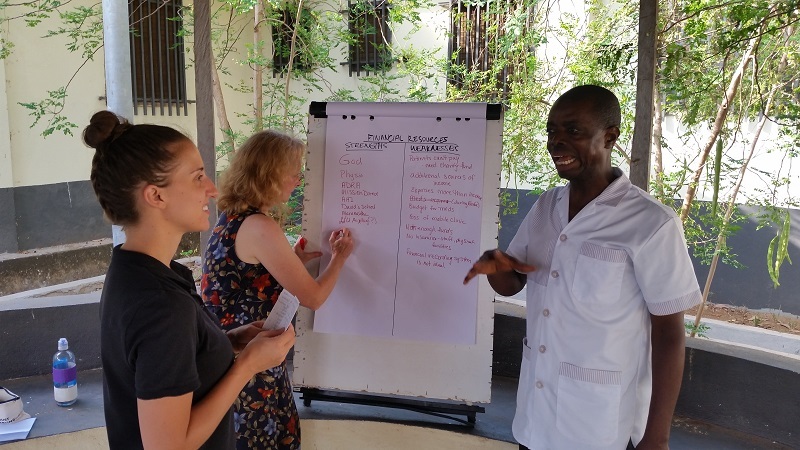 And in fact, the vision statement of AHS gives us a clear mandate to provide care to all people in Sierra Leone, not just those around Waterloo. It was not long after we arrived that the first call came in. 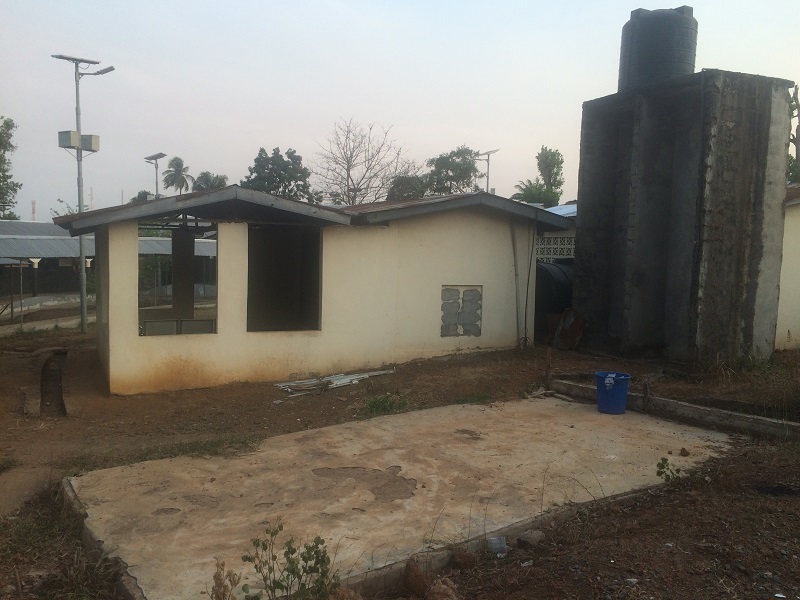 The Adventist Church in Bo, in central SL, wanted to re-open their clinic. 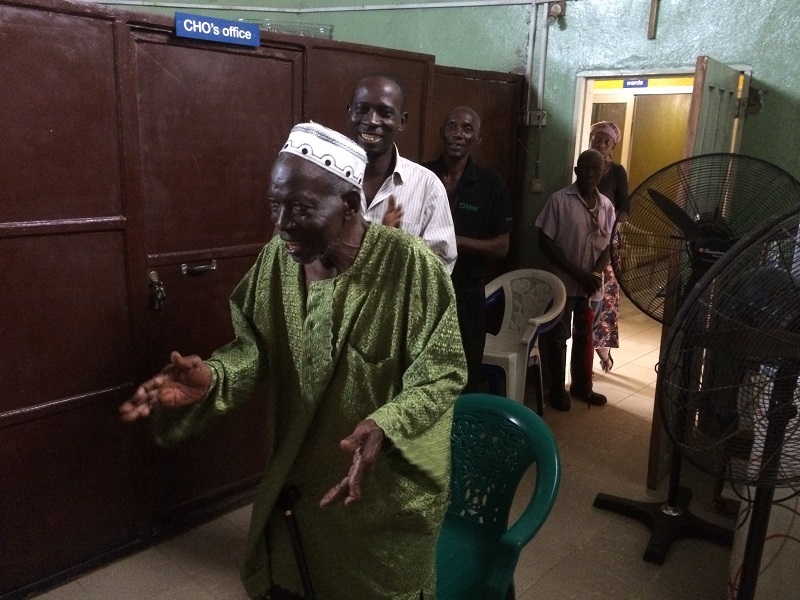 It had closed down during Ebola and they felt the time had come to try it again, this time under the AHS umbrella. 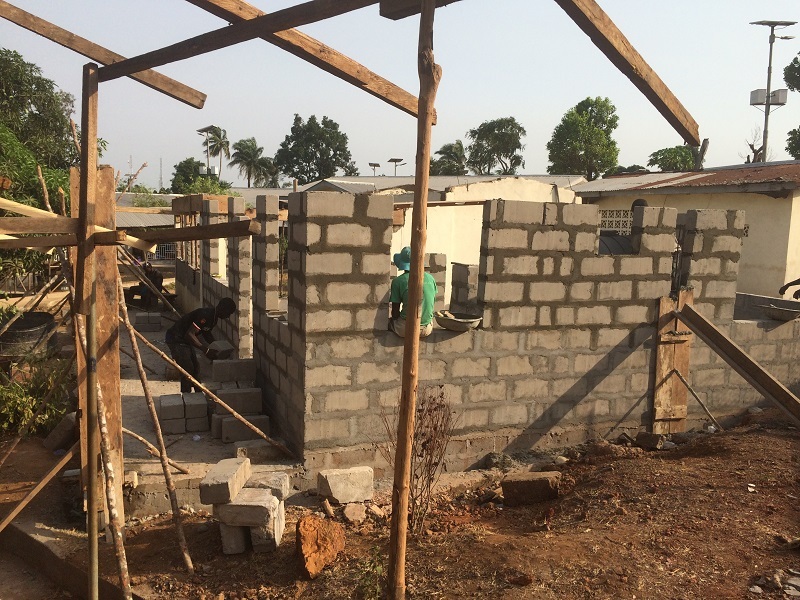 About that time we were approached by an NGO out of the UK, Home Leone, which is in the process of building a 380 unit village for inhabitants of the slums in Freetown. Part of the village plan is a clinic, and they wanted to know if AHS would manage it. 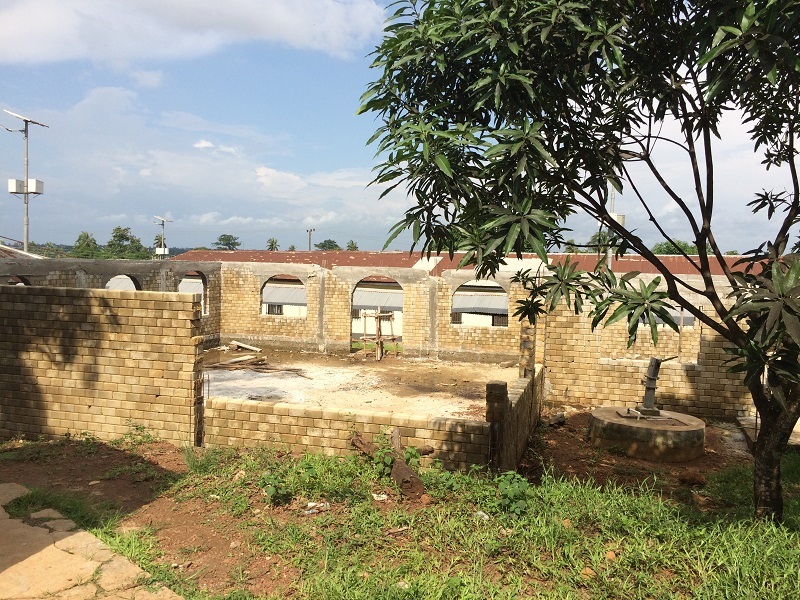 Then a couple of months later we received word that the Adventists in Kono District, better known as the site of the “Blood Diamonds” story, were asking if we would consider opening an AHS clinic in their town of Kimbadu, on the outskirts of Koidu. Three potential new clinics was a bit overwhelming, but AHS had learned to keep moving as long as God seemed to be leading, and see where He would take us. We had no idea where we would get the money for the necessary capital expenditures in Bo and Kimbadu, but as we spread the news, the SDA elementary school in Simi Valley was touched by the story of Bo and took it on as their mission project. Then the Loma Linda University School of Medicine Class of 2019 adopted AHS as their class mission project, specifically raising money for the Kimbadu clinic. 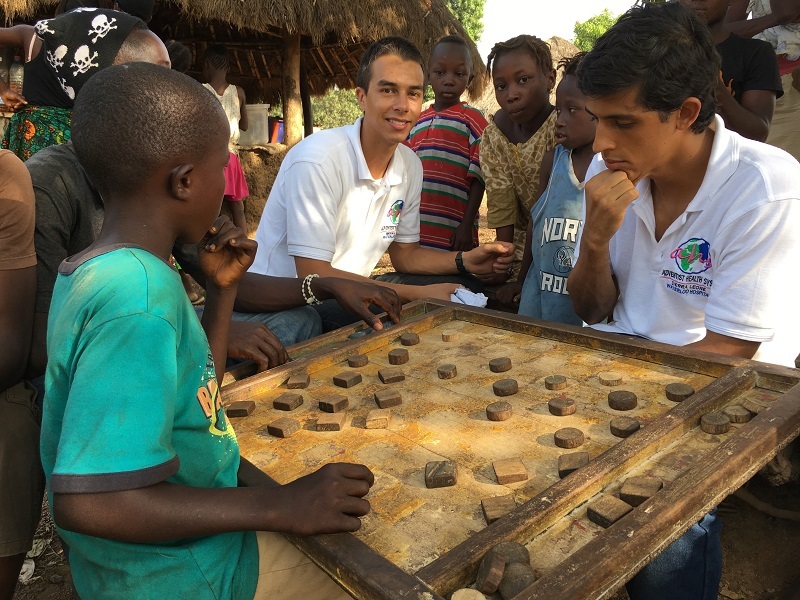 Finally, our relationship with Home Leone has continued to grow, as we are sharing resources to benefit both organizations in our mutual quest to help the people here. In April of last year we held a two day strategic planning meeting. We came out of it with a bold, and to many minds, ridiculous, vision and plan. And I of course was one of those who thought, “It can’t be done,” at least not anytime soon. Well, I thought I would just let you know what has happened to that Strategic Plan and how God apparently views it. I am telling you it is His doing, not ours. Julian, our CFO, is also a vocalist, here he is singing in the choir. Our accounting system has consisted of income and expense reports done on Excel. In early December I added up all the income since we re-opened in November 2015, and compared that to all our recorded expenses. When I looked at the cash we had on hand and the difference between our income and expenses we were missing 50 million leones ($7,500). A quick search revealed a stack of expense vouchers in the accounts office that stood 6 inches high. Surprise, surprise, they totaled up to almost 50 million leones. It was good to account for the money, but it also meant that all our income/expense reports were bogus as were the decisions we had made based on them. Julian getting badly beaten at checkers. Good thing he doesn’t gamble. 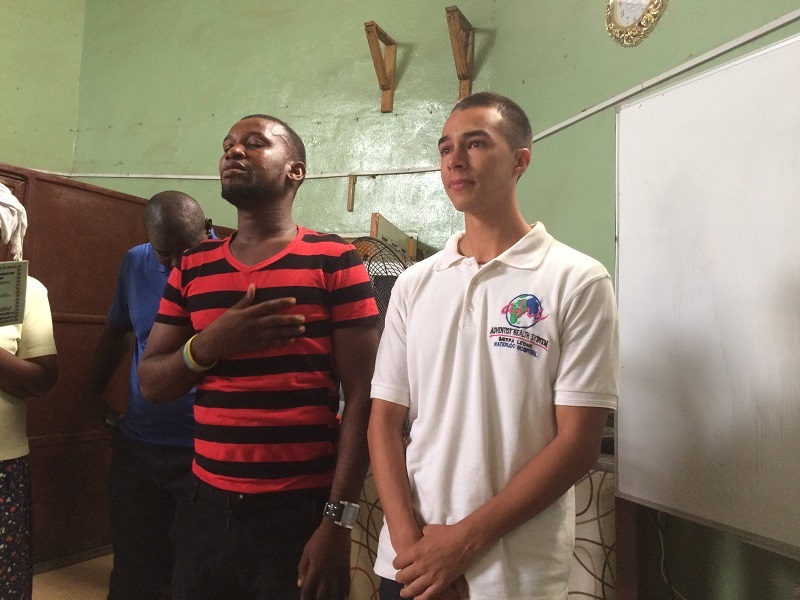 Last July we received notice that Julian Marin, a young man from Columbia, wanted to come volunteer with us. He was actually answering the call we had put in for an assistant for Bekki. However, he was way overqualified, Bachelors and Masters degrees in accounting, finance and computers. Shortly after arriving here he told us he could help us develop an accounting system. He spent the fall months writing the software and then it went on line in December. In December he took on the position of Chief Financial Officer of our Adventist Health System. 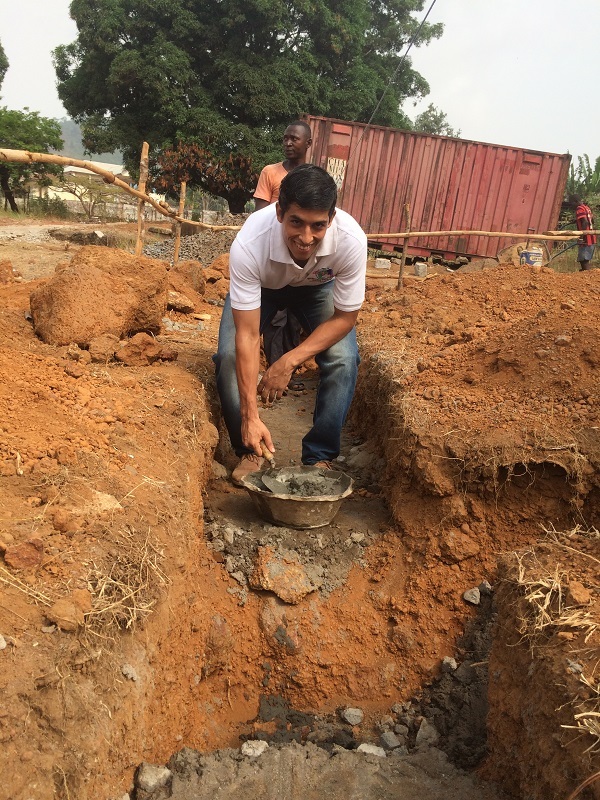 Julian is laying the cornerstone of the new guest house he is raising money for. Now we have a working accounting system, we have Julian watching over the accounts department to make sure we don’t have a repeat of the expense voucher fiasco, and we can get accurate reports when we need them, and we know how much money we have, or how much we owe, what our true financial picture with just a few key strokes. Mission Direct is an NGO out of the UK (like a non-SDA Maranatha) that has projects all over the world, building schools, orphanages, bakeries and helping hospitals. 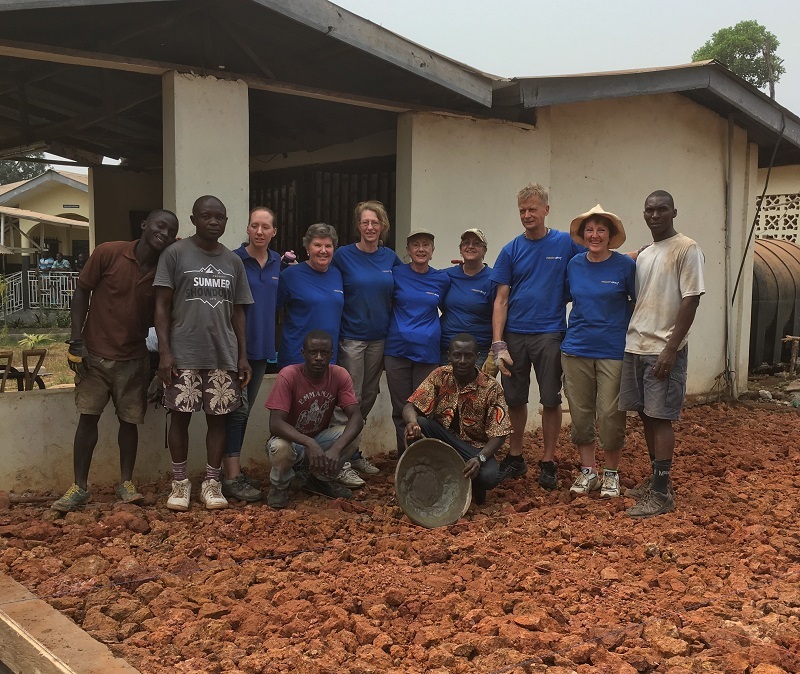 They have worked with us for 10 years, and have done most of the building of the current hospital, including the guest rooms that are in constant use by our volunteers. 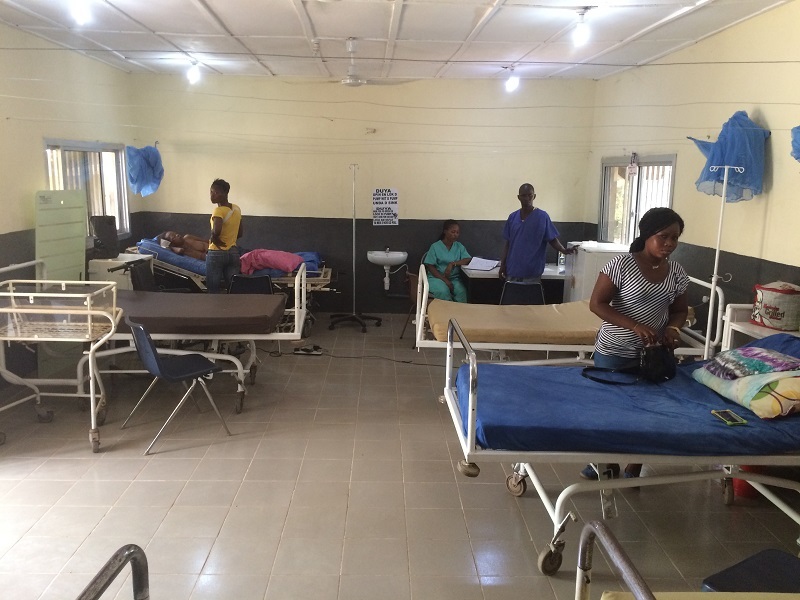 Well, a few years ago, pre-ebola, Mission Direct constructed a new wing (lovingly referred to as the extension) for the hospital, with 2 wards, Labor and Delivery Suite, and 5 private rooms. The project reached a stand-still however as funds became an issue. 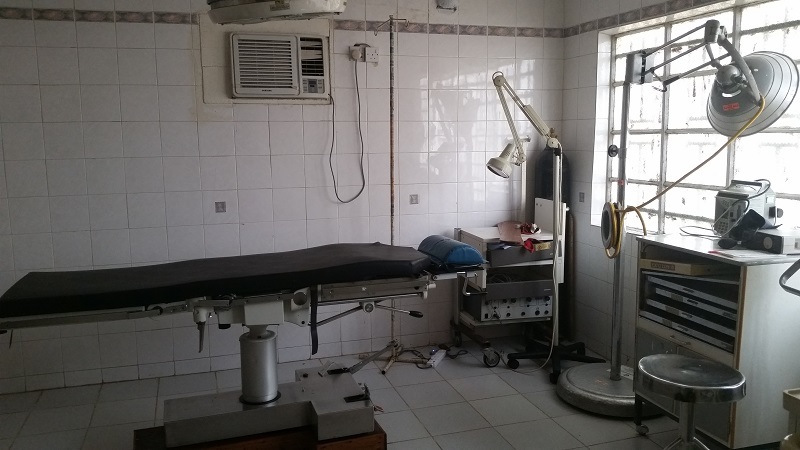 Nevertheless, this is Africa, and partially finished is usable, so we have been using the unfinished private rooms and the one of the wards is the temporary home to physical therapy. But, the extension needed finished. 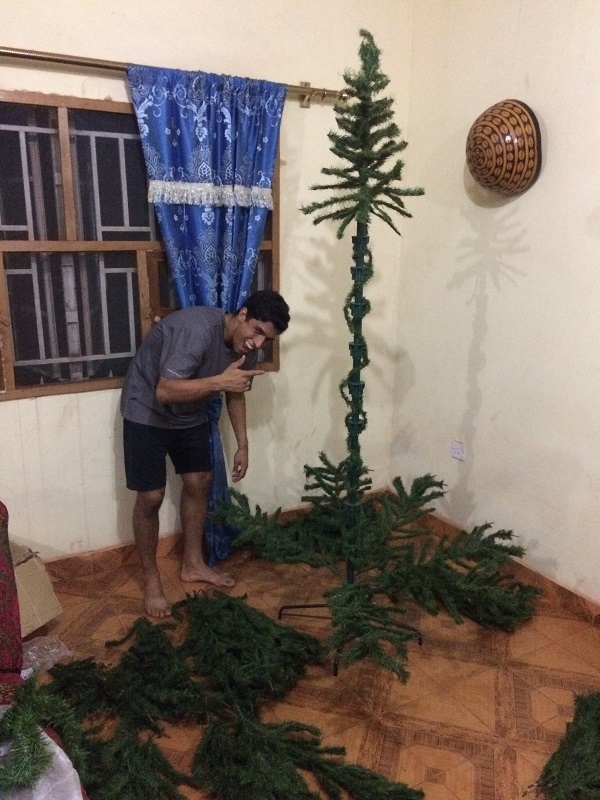 We figured it would take $20,000 to finish it off. Where would the money come from? Praise God for the Winifred Stevens Foundation. They included the extension in their grant! New women’s and Pediatric Ward. We got to work and re-did the electrical and plumbing, bringing it up to a better standard, we got rid of the steep slopes in the corridor that made moving patients not only difficult but dangerous, we got the leaks in the roof fixed, tiled the wards and made the private rooms worthy of the name. In March a Mission Direct team was here and we had a special grand opening ceremony with them and the Conference officials and local dignitaries. The extension is open for business!! 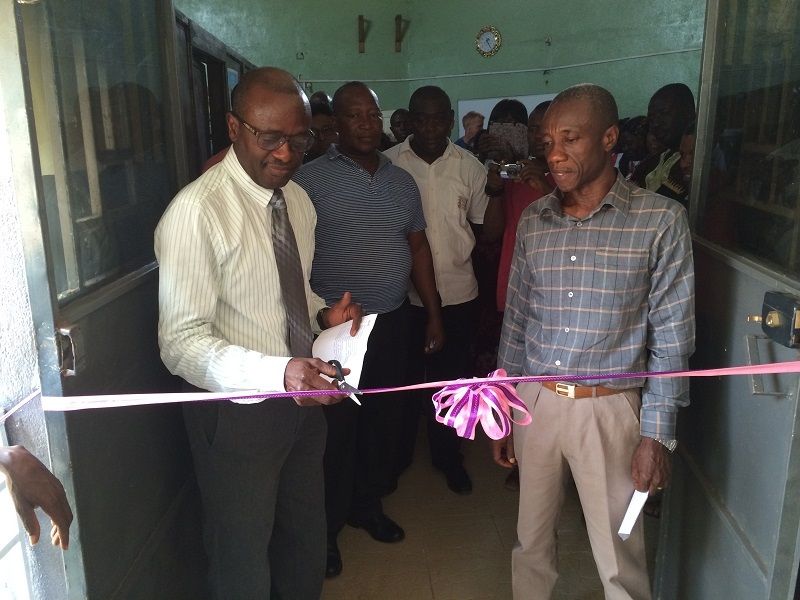 Opening ceremony for the extension with Pastor Daniel Sandy, the Sierra Leone Mission President, and local dignitaries. The first women’s and pediatrics ward is typically close to full. Physio continues to use the other ward until we get them into their new building. Four of the five private rooms are open for business, with Mr. Danquah our Director of Spiritual Ministries is using the fifth room as an office. 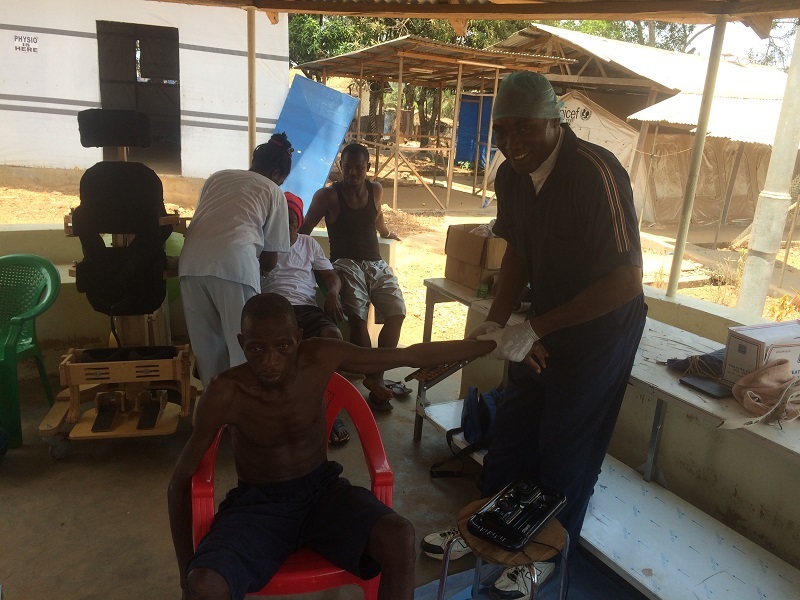 Samson doing physio in the Palava Hut, April 2016. It was just 14 months ago that we opened a new service at AHS, Physiotherapy as it is called here. 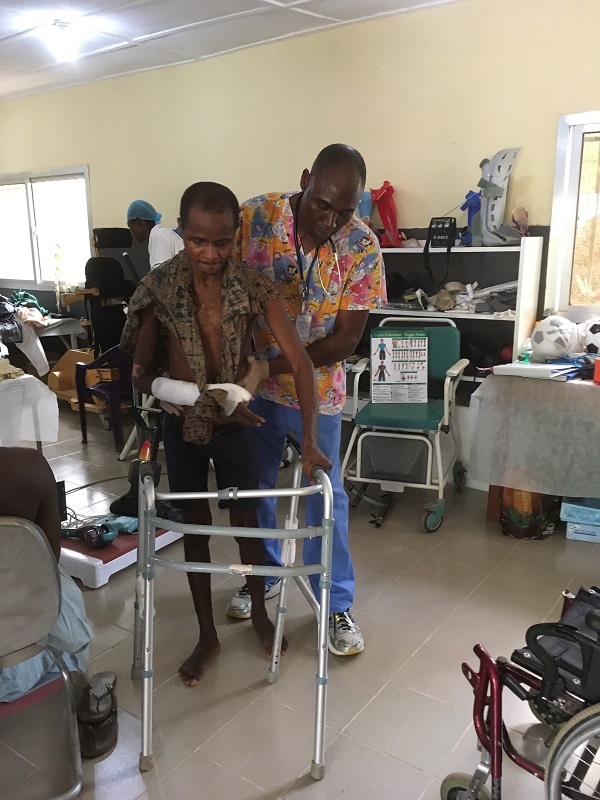 Samson Idowu from Nigeria has brought his special skills to serve our patients. He uses a combination of massage and strengthening exercises to get people up and on their feet again. Sonya Bradburn, Occupational Therapist from Tillamook, Oregon working with patients in the physio department. 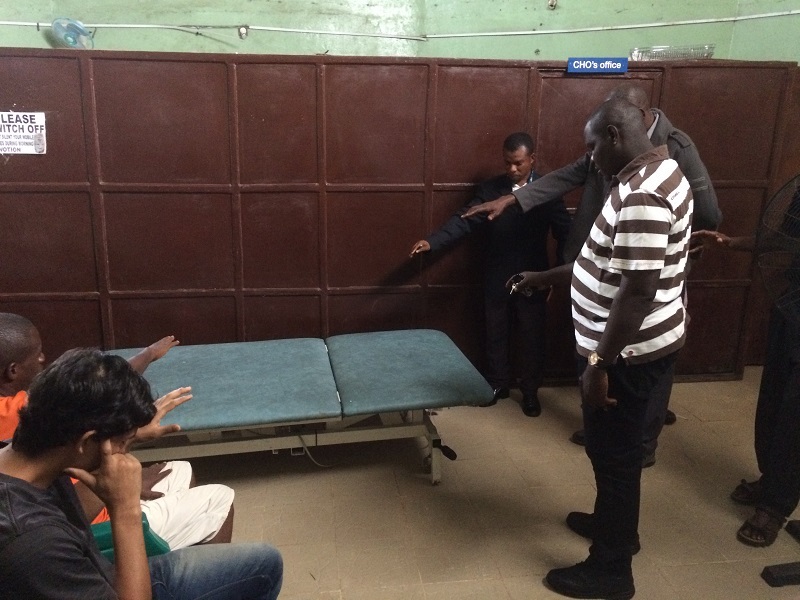 He rightly has pointed out that many of the patients suffer from PTSD due to the Rebel War or Ebola and mostly they need a loving touch, prayer and encouragement. We often have people come in to the hospital unable to walk or move their upper limbs. After just a few days working with Samson and his assistant Zainab, many are functional again. Samson working in the Physio room of the finished extension. 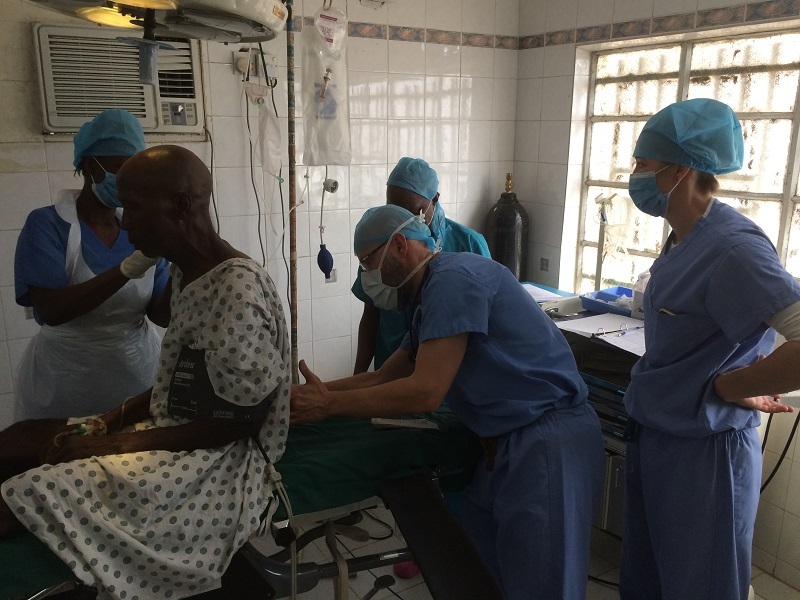 We have been blessed to have occupational and physical therapists from the US come and work with our team. In May we will have a massage therapist from Canada for 3 weeks. These specialists all bring new skills and education to our physio team, and the rest of the nursing staff. Thanks again to the grant from the Winifred Stevens Foundation we are in the process of constructing a new home for Physio. The building will include a general treatment room, a massage therapy room, patient changing rooms and a storage room. A special bonus is the new office for our manager and secretary, which will free up needed space in the hospital. The HIV Counseling Center, and site of the new Pharmacy and Lab. Our pharmacist does her best to work out of a 4X12 foot closet, and although the lab is in a larger room, it too is undersized. Both departments need more room and stable power so they keep medications and certain reagents refrigerated. In addition, we need a blood bank. Currently patients who need a blood transfusion have to find a donor, and then once a match is found, blood is taken from the donor, placed in a transfusion pouch and directly transfused into the patient. That system does have some merit. There is no question that fresh whole blood is better for you than aged blood components, such as packed red cells. However, it only works for chronic or semi-acute anemias. Any patient who is actively bleeding and needs a transfusion right now, is out of luck. But to have a blood bank requires stable electricity with battery backup. We are on our way to the electricity part with the recent purchase of a 15kva diesel generator. This way we now have power 18 hours a day. We will need some battery back-up for the lab and pharmacy though, to make sure their refrigerators never go above a certain temperature. One of the Mission Direct Teams from the UK. But what about the rooms themselves? Enter our old friends, Mission Direct, from the UK. They have agreed to take on, as much as they can, the project of adding on to, and remodeling our HIV counseling center. The foundation is done, the slab is poured and a team in coming the second week of April to continue on with the walls. As God sends the money they will send the teams to get the job finished. 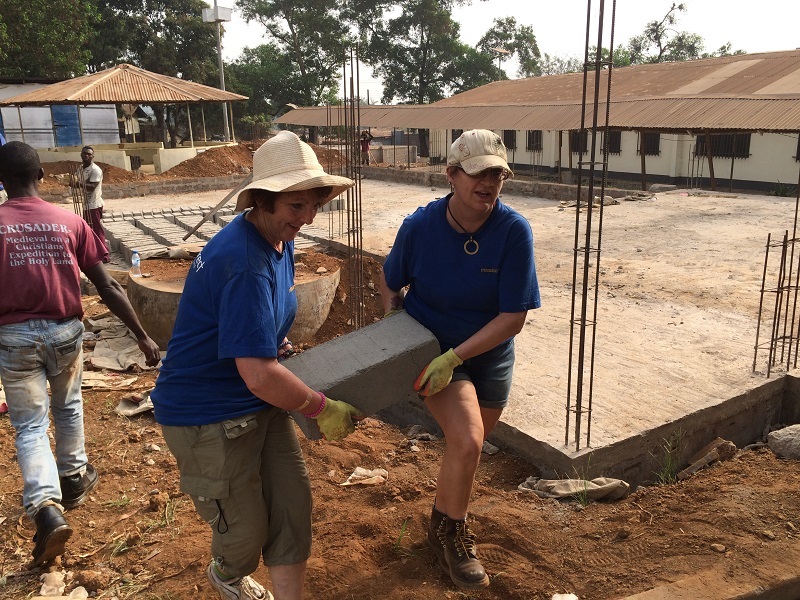 Mission Direct Team members hauling block in the hot African sun. 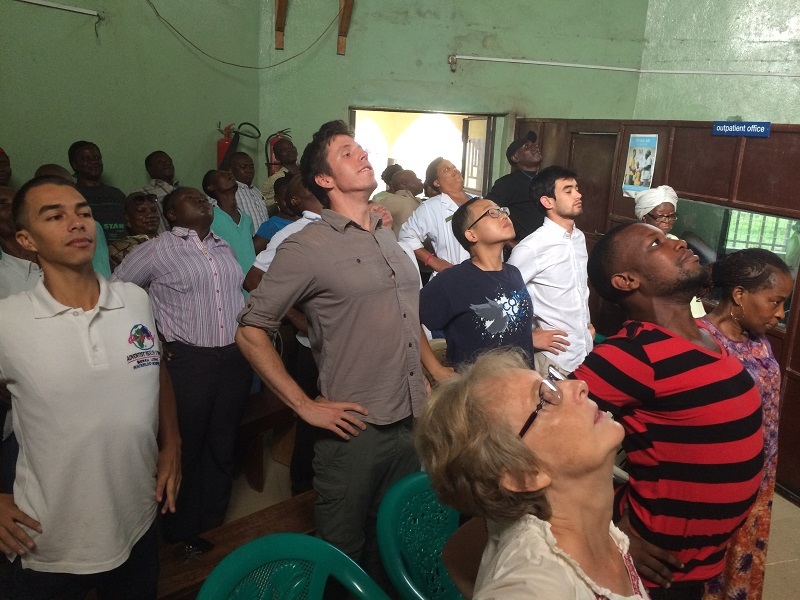 Last Sabbath, April 1, marked the one year anniversary for Bekki and I to be in Sierra Leone. The experience here has been very different than our experience in Tchad, but one thing hasn’t changed, God’s providence. 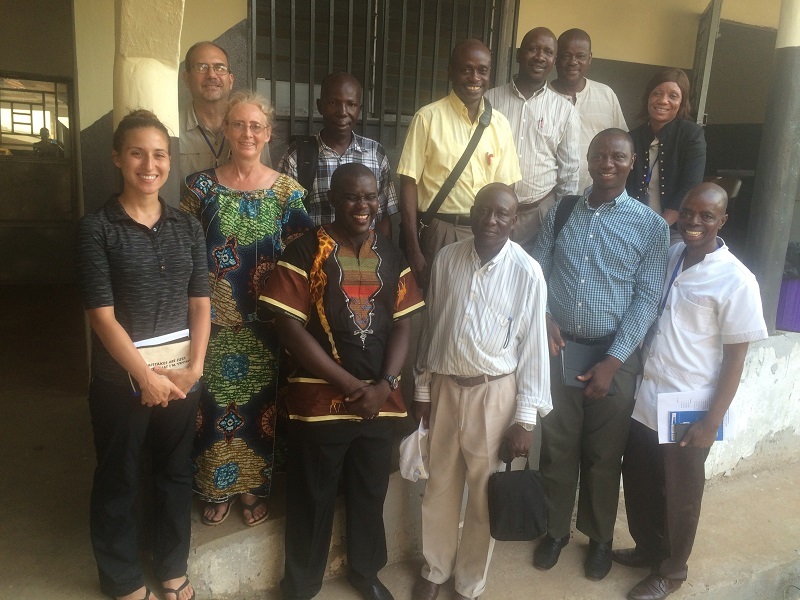 As we reflect over all that God has done at the Adventist Health System in Sierra Leone we are humbled and privileged to be a small part of it. This is the first in a multi part series detailing how God has blessed in the last year. In April of last year we held a two day strategic planning meeting. We came out of it with a bold, and to many minds, ridiculous, vision and plan. And I of course was one of those who thought, “It can’t be done,” at least not anytime soon. Well, I thought I would just let you know what has happened to that Strategic Plan and how God apparently views it. As all that I am going to tell you is His doing, not ours. 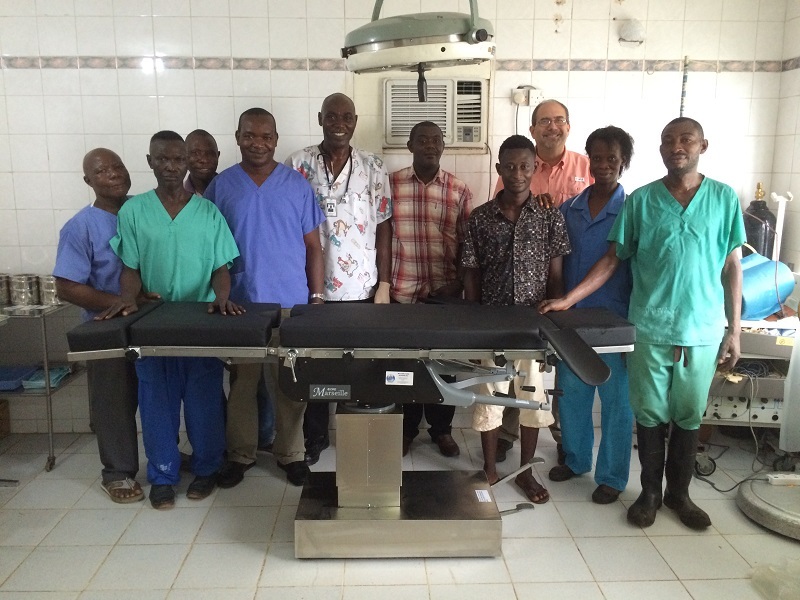 You may recall that when we arrived I found Dr. Koroma doing amazing operations under very adverse conditions. Inadequate light, no cautery, no suction, an OR table that was frozen in one position, an untrained anesthetist who did not know the most basic airway maneuvers, just to name a few. Oh yea, a super tiny table-top dental autoclave that barely worked, and four other autoclaves that did not work at all. 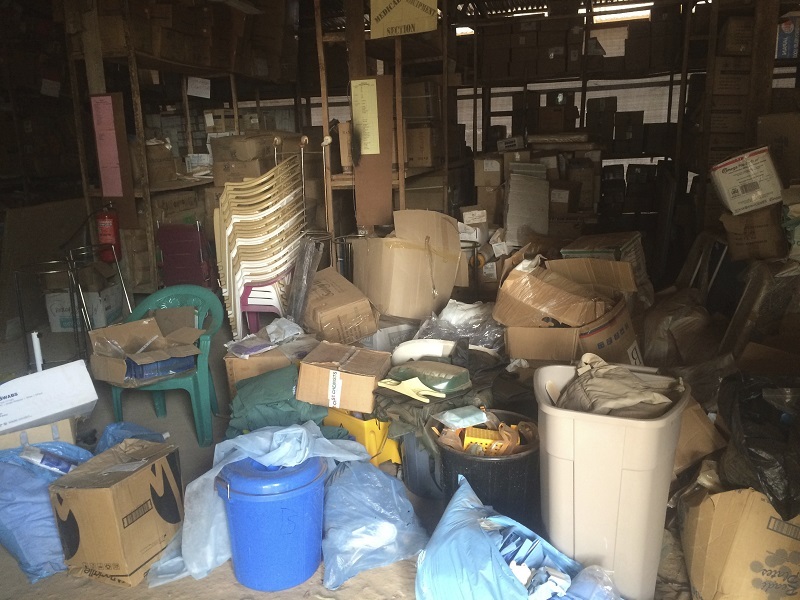 The OR area was packed with outdated (I mean 25 years outdated) items, including suture, and other materials. The minor room was home to four nonworking typewriters, and most rooms were so full of junk it was difficult to open the door. Our very empty and bleak OR. After many sweaty hours we were able to get the usable material separated from the unusable, the good from the bad if you will. (And we got the typewriters cleared out.) AHI, Brothers Brother Foundation and Healey Foundation helped us get a new OR table (that works!!! ), suction and cautery. 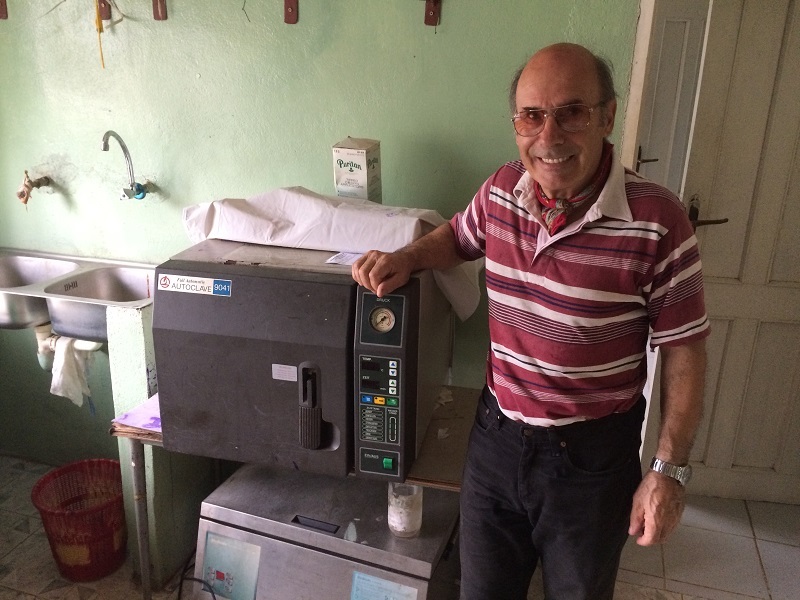 Remy with the autoclave he repaired for us. Remy Hirschy from Geneva got one of the other autoclaves working for us. Then a grant from the Winifred Stevens Foundation came through allowing us to put in windows that blocked the dust from coming inside, do some badly needed repairs, and I just ordered a new full sized steam autoclave, made specifically for use in mission hospitals, and a generator that will allow us to do surgery after hours. The moving crew with the new OR Table. 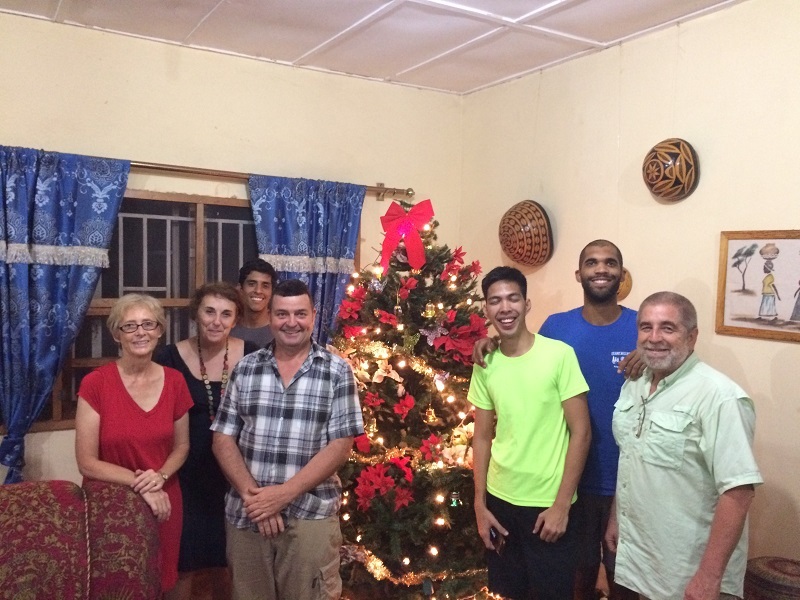 And, last, but not least, Emanuel Soffa completed his anesthesia training course and is now serving as our permanent anesthetist. To help round out his education, Dr. Tim Mercer, Anesthesiologist, LLUSOM Class of ’85 (a great class) came over with his wife Connie, who is a PACU nurse, and did more education with him and set up a PACU protocol for our nurses. We had another team of CRNA’s from Asheville, NC led by Mason McDowell, of Bere Hospital fame, come in March to continue that training and the training of our nursing staff. Team Tarheel (from Ashville, North Carolina) working with Soffa on spinal technique. Bekki was overwhelmed when she was given the monumental task of organizing and inventorying the stores, or warehouse. It is a 40 X 48 foot structure made of termite eaten studs and tarpaulin, it is stuffed with supplies. Again, some useful, much of it not useful. Much of it from Ebola days. We have enough Ebola PPE (personal protective equipment) to last for 20 years. The state of the stores (central supply), before Bekki took over. But, in her usual quiet, organized way she started the job. She got several young men who came to be known as Mrs. Scott’s guys to help her as they sorted, cleaned and discarded. 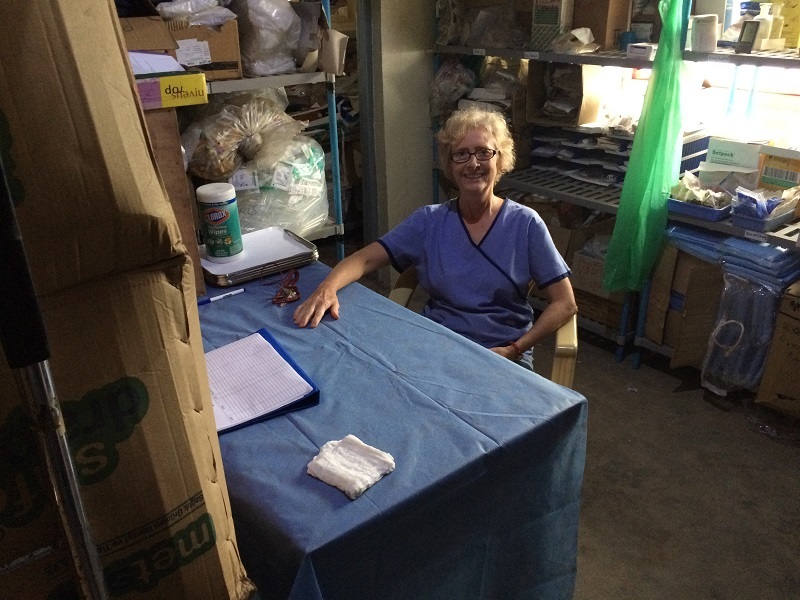 Doug Abbot, a nurse from California, came to us for a year, and he has cheerfully taken on the role as her assistant (read taken over the job). He has taken over the inventory process, and does his best to make sure we don’t run out of supplies. Buford SDA Church near Atlanta Georgia helped us with funds to convert an unused area into a mini-warehouse that we climate controlled to preserve the material. Now in her air conditioned office, Bekki is surrounded by neatly stacked and organized supplies. So now we have some idea of what we have, and things that have been donated are being used before they outdate, or go bad. Our next goal is to take the three 40 foot containers we have and use them as the walls of a permanent 40X48 warehouse, part of which will be climate controlled. We can then return the current storage space to it’s intended purpose of labor and delivery.